Are you a movie buff and also a travel freak? If yes, this contest may excite you. 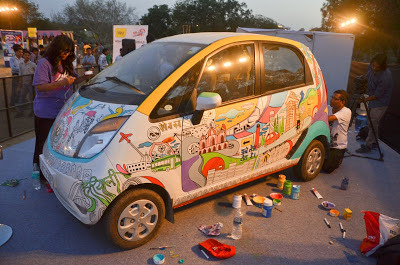 NanoArt-in-motion project is an artsy venture, which is on mission to glorify Delhi’s unique colors through Nano as Canvas. Recently, Team Fukrey join hands with this project to promote their upcoming movie. The stars of upcoming movie Fukrey were seen hanging out in the Saddi Dilli's Nano car. Nano Art-in-motion project collaborates with the movie Fukrey recently. Fukrey is an Excel Entertainment film, which is produced by Ritesh Sidhwani and Farhan Akthar. Mrighdeep Singh Lamba directed this fun film, which will be releasing on June 14,2013. Go Fukra is the latest contest for all the Delhi-ites, which was announced today. The Fukrey Team also launched a Nano-Fukrey app on Facebook. The stars of Fukrey: Richa Chaddha, Ali Fazal, Varun Sharma, Pulkit Samrat and Manjot Singh have recently toured Delhi’s most happening hang-outs in Nano art car. 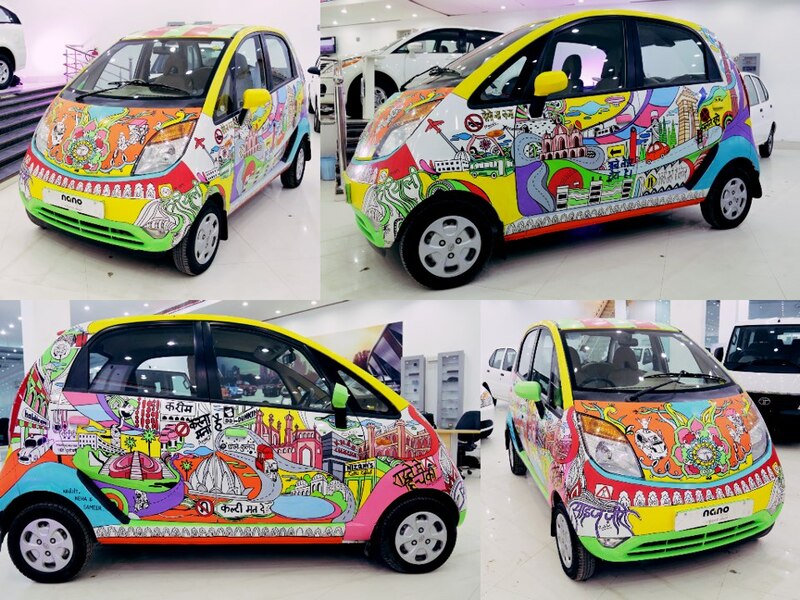 The design of Nano Saddi Dilli car was inspired from the matchless flavors of Delhi. 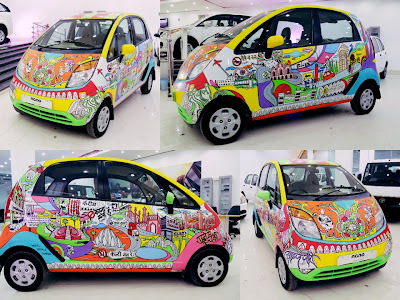 The Doodlers - (Known Painting trio from Mumbai) decorated the cars that exude pop art culture and the uniqueness associated with Delhi. Now you can visit www.facebook.com/tatananopage and participate in the Contest especially made for the Dilli-wallas. The contest will start on May 27th. The Nano: Art-in-motion project is launched especially to associate Nano with the symbol of individuality, expression and creativity. The project want artists to use Nano as canvas for life and paint their heart out. With this innovative project, Nano is trying to reflect the power of art and individual expression. Do you think world’s cheapest car Nano will be able to attract consumers with this project? Nano was actually designed for the masses but this vehicle never reached that expected popularity. The car created lots of buzz before the launch however all the excitement literally slowed down. Nano is surely in the revival mode with such collaborations. What’s your take on it? Woow .. Nano at its best ... beautiful artwork ! thanks for the share !